Study in Rose and Brown is also referred to as A Study in Brown. Unlike Whistler’s full-length portraits, this study truncates the sitter’s body at the waist. The brushstrokes are looser than in other works by the artist, giving the work a slightly unfinished feel. Though he lived and worked in London, by 1913 Whistler’s career was well-established on both sides of the Atlantic, and major American collectors and museums were acquiring his work. 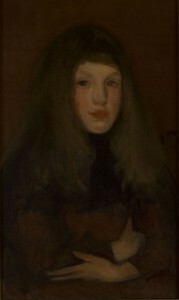 Study in Rose and Brown was one of four paintings by Whistler that were included in the Armory Show. They hung in Gallery P alongside other nineteenth-century works as part of the display of historical art. Whistler, like the American artists Albert Pinkham Ryder, John Twatchman, and Theodore Robinson, was positioned in the Armory Show as an American precursor to the modernist styles that would be on view in the nearby contemporary galleries. Raymond Wyer, “James McNeill Whistler,” Aesthetics 2 (October, 1913-July 1914), 34. See also Andrew Young, The Paintings of James M. Whistler (New Haven: Yale University Press, 1980), 153. The first painting by Whistler to enter a public collection was Arrangement in Black [Lady with the Yellow Buskin] in 1895 at the Philadelphia Museum of Art. Many other institutions followed suit, including the Museum of Fine Arts, Boston, in 1896. Kenyon Cox, “The ‘Modern’ Spirit in Art,” Harper’s Weekly, March 15, 1913; and “International Art,” New York Evening Post, February 22, 1913, 5. “Wyer to resign position,” Muskegon Chronicle, October 9, 1915, 1.